Last week Josh woke up early and asked me what I wanted for breakfast-his treat. I voted for pancakes, but told him I didn’t care what variety. He came back in the room and asked if he could make our sinful Cinnamon Streusel Pancakes. I said sure, I was going to enjoy my final week of being pregnant and indulge:) As he turned to leave the room, I had an idea. I told him to make Pumpkin Cinnamon Streusel Pancakes-a little twist on our favorite recipe. Josh went to work in the kitchen and came up with the most amazing pancakes I have ever tasted. The pumpkin pancakes are light and fluffy and the cinnamon streusel on top goes perfectly with the fall spices. I wish I could tell you how delicious these pancakes are, but there really are no words to describe them. They are too good! My mouth is watering as I type and I wish I had another stack to eat right now. I am telling you, if you are a pumpkin fan and looking for a special fall breakfast or brunch recipe, look no further. 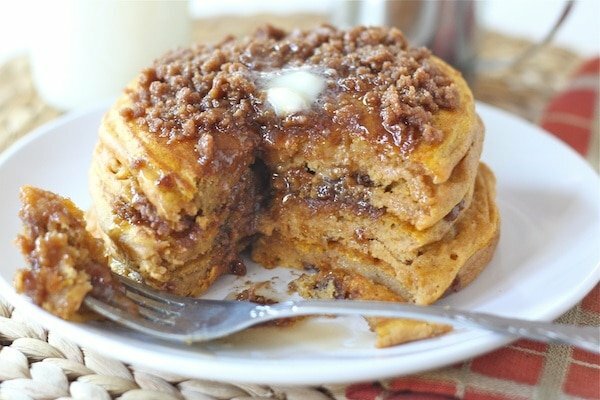 You have to make these Pumpkin Cinnamon Streusel Pancakes. I guarantee you will fall head over heels for these babies. I can’t get them out of my mind-I even dream about them. They are SO good. 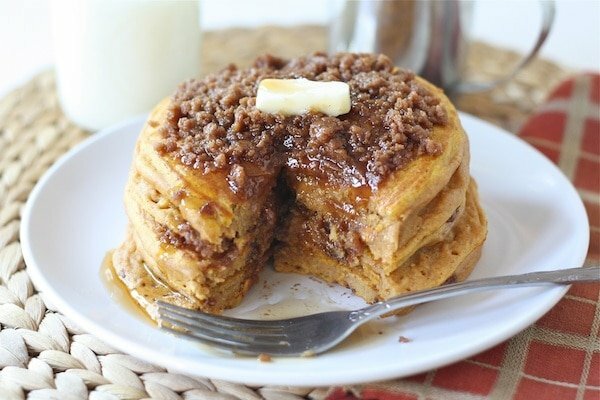 So get into the kitchen and whip up a batch of Pumpkin Cinnamon Streusel Pancakes. There is no better way to start the day! Baby update-my due date was Saturday and I am still pregnant:) I guess our little pea has his own time schedule and will come when he is ready. We are just waiting now! We will keep you updated! Serve pancakes warm with maple syrup and butter. These look amazing! What a fantastic breakfast treat. Good luck with the next few days, I hope little pea makes an appearance soon! Your josh is just amazing!!! Those look so warm and comforting. Hang in there!! OMG, those look fantastic! What a great idea. These look fantastic! Thanks for linking my pumpkin pancakes post as well =). I love Cinnamon Streusel anything. Brown sugar, butter, and cinny (and oats sometimes too) can do no wrong in my book! you had me at streusel! i love the idea of these pancakes…and i’m kicking myself for not getting up earlier so i could make them right this second! Wow! What a delicious & healthy breakfast! Yep, I want one right now. They look delicious! Anxiously awaiting the news!! I was so frustrated when two of mine were late. Our first came right on her due date, second was 11 days late (ugh!!) and the third was a day overdue. They will definitely come when they’re ready! What a perfect fall breakfast! I’m excited for you to finally hold your little one. Oh my goodness…. those do look sinful!! Must make these asap! Hope baby decides to make an entrance soon…….best of luck! These pancakes look too good for words!! Can’t WAIT for baby pea to get here!! Mmmm! 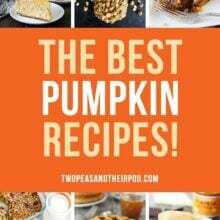 I’m all about pumpkin right now, and I could definitely enjoy a stack of these! Can’t wait to try them! Those really are gorgeous Maria!! Yay for Fall pancakes!! These sound amazing, Maria! I can’t wait to meet that little pea. Hang in there, and try not to get too discouraged. Easier said than done, I know. These do sound like the ultimate Fall breakfast! Yum! These pancakes look great! Prefect for the Fall. Good job, Josh! Ooh, these are the pancakes you were mentioning… Mmmm… CANNOT wait to try a gluten-free version of these! Yum, don’t these look decadent! What a treat! I made oatmeal pumpkin pancakes this weekend and thought they were great, until I just saw this streusel topping! Ah-mazing. 🙂 My due date was last Sunday and I’m still pregnant too! Hope all goes well and thanks for the lovely recipe! I know why that baby hasn’t decided to come out yet….because you’re eating ridiculous good food like these incredible pancakes for breakfast! I’d want to stay right where I was too if I had good stuff like that coming my waY! lol Wiishing you all the best and a quick and easy delivery! I need to go make pancakes now! Goodness gracious those are some delicious looking pancakes! Hope your little pea arrives soon. Until then, put your feet up and enjoy the wait. Pancakes look delicious! I hope baby comes soon, especially since you were thinking of a September baby. I remember when one of my was due Nov 17 and didn’t come till Dec 4th. I couldn’t believe he held on until December, but then my 4 babies were all a week to two weeks late! Love the blog! Goodness Maria – those look decadent and delish!! I am swooning! Oh my word, I can not even tell you how much my mouth is watering right now! These are the perfect hubby makes you a treat while you relax treat! Good luck with the last part (hours, hopefully) of your pregnancy! Seriously, these look delicious. The pancakes look perfect and with the streusel…wow…sounds so good. Oh yum, what a great treat for a chilly fall weekend. Can’t wait to give them a try! Wow…thats a tempting pancake idea. I love making pancakes and added ur recipe to my Must Try List…!!! OH, this could be bad! You’ve combined one of my favorite flavors into one of my favorite foods. I see overindulgences all over this!!! Wow….. That’s all I can say. I am big eyed and drop-jawed staring at my screen. Wow…. I just made pumpkin soup but now this is so appealing to me! Baby comes when he/she comes. For me, baby #1 was induced at 40 weeks, baby #2 induced at 41 weeks and baby #3 induced at 42 weeks. I guess it’s good I’m stopping at three (sniff) because they were getting increasingly anxious to stay. In the meantime there’s pumpkin pancakes. 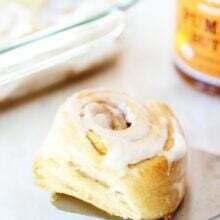 I am one of those people who loves a chilly weekend morning with pjs, coffee and a sweet breakfast treat. It’s a total indulgence that I wait all week for. And these pancakes fit right into my motto of “moderation not deprivation!” Can’t wait to work them into my next weekend breakfast! I have one final long run left to do before my marathon and this is SO going to be what I eat after it! sinful – love adding pumpkin to baking – will try the pancakes. Oh that streusel! Just too darn tempting. What a wonderful way to have a breakfast feast. The looks delcious! Superb!! Oh, yum, some of my favorite flavors! OMGOSH I am drooling!! lol..amazing! thanks for sharing..I love ANYTHING with pumpkin in it, especially this time of year! love the recipe & the pics! Thanks so much! This is hitting our menu list this week!! Can’t wait to make it. Man oh man do those look delicious. I think it’s so impressive that you’re still up and baking… two days past your due date! Can’t wait for pictures of the baby! The pancakes look fabulous. Thanks for sharing. I know what you mean about foods like this. There is no way to put into words how good it it. You just have to make it and eat it for yourself! And I believe I’ll do just that. Best of luck on parenthood! It’s something I’ll always cherish. WOW delicious! Can’t wait to try these for my man! Would it be shameful if I made these just for me since I live by myself? I’m going to hope the answer is no and do it. Wow! These look so delicious! I love the idea of the streusel on top! Very clever!! Baby will be here soon:)I know the last days are too long. These pancakes are wonderful. I hope you are feeling well. These look incredible! And good luck waiting for your baby. It is soooo worth the wait. My baby is almost 11 months already and it’s been the best 11 months of my life! What a decadent pancake breakfast! Yes you must enjoy these last few days of being pregnant because although you will be happy to hold your little one, you will miss him being inside of you and so close. At least I did! Well we loved the regular streusel version so I must try the pumpkin version, looks so good! Those look delicious! What a sweet husband. I’m pretty darn sure that I would fall head-over-heels for these pancakes. Sinfully good! Awaiting for baby news, as and when it happens!!! How funny! Our dumpling is being seriously stubborn, too! I’m STILL pregnant! Jack really needs to come out of his box in the next 48 hours, though! Blessings! oh, MY, do they look decadent! thanks for this!! Oh my word these look amazing! I will be making them this weekend. Thanks so much for the recipe! Are you kidding me with these? Holy moly…pumpkin AND cinnamon streusel? I need to make these ASAP! Looks delicious! I like how as each picture is taken you can see the butter melt =) And congrats on your baby boy! So precious! Posting again because I made these and then I realized I was in heaven. One of the absolute best things I have EVER made!!! And so simple. Yummmmmm. These look amazing. In spite of how many carbs I’ve had this week I can honestly say I believe I could eat this entire stack, especially if smothered in syrup they look heavenly. Hope your delivery is quick like mine were. My son took 3 hours while my daughter a mere 30 minutes. What a wonderful looking fall breakfast. I still need to make the original streusel pancakes, but these may top them! Congrats on the little one by the way! These are soooo pinned! Love everything about them. Heard it through the grapevine that the little one arrived. Congrats! Great pancakes. What a deeelicious looking breakfast! I had to comment again…because I just now made these. Oh, my! They are simply amazing, and I cannot wait to make them again for the family this weekend. Thank you!! these look and sound amazing! the pictures are beautiful..the recipe is brilliant!!! I just made these for my roommate & I on a lazy Saturday morning. (: They are an instant favorite! Thank-you so much for posting this. I will never be the same after this. It was the perfect way to usher in the Autumn season. Glad you enjoyed the pancakes! They are perfect for fall! OMG…just made these. I feel like I am in stomach-exploding pumpkin pancake bliss. Good thing I made them for brunch…I’m sure I will be full until suppertime. Soo good, great recipe. They are filling and oh so good:) Glad you liked them! You can send Josh to my house anytime to make these! WOW! These have my mouth watering. Go Josh! Great idea to add the pumpkin! mmm pumpkin pancakes………..I can smell them already! I need to make these! We made these for our Sunday Brunch. They were fantastic! Thanks for the recipe. These look absolutely delicious. They are a perfect fall breakfast. I am going to make them when I come home for the weekend. Please excuse my ignorance: I live in Australia and have never seen canned pumpkin in my life (let alone pumpkin pie filling)! Is it anything like real pumpkin? Is it possible to substitute real pumpkin? I presume I would steam or boil it and then mash it… Would that work? Thanks in advance for your feedback! You can use real pumpkin puree if you can’t find canned pumpkin. Made these today for my family. I double the batch, and we just had the leftovers for dinner. My son says this is the only kind of pancake he wants from now on! They were SO wonderful! Thanks for sharing the recipe! They are my favorite pancakes too! Glad you all liked them! Yes, you can use all regular flour. Enjoy! Loved these! Made them sans topping and they were fabulous. I could eat pumpkin every day. These were fantastic!! Of course mine didn’t look like the picture but still amazing! I think next time i will skip the topping though because they were soooo rich and sweet, but i love pumpkin anything!! Glad you enjoyed the pancakes! Just made these and they are absolutely fantastic!!! I’m in love with these pancakes!! They are my favorite! Glad you liked them too! Made these tonight for Shrove Tuesday – oh my goodness they were delicious!!! I couldn’t resist those pancakes – the combination of streusel and pumpkin was just too tempting. And, yes, the pumpkin pancake batter turned out as awesome, as expected. As for the topping… I’m a big fan of streusel/crumbs, but those I put on top of these pancakes (after browning them on one side and turning them over) didn’t come out crumbly and crunchy, like with cake. They were moist and sticky, and sort of gooey. Definitely not what I want from my streusel. So with the other batches I’d only sprinkle the streusel on one side, fry them for a bit, then turn the pancakes over and leave the top unadorned. This way the streusel would fry at the bottom, the sugar would carmelize, and ta-da! 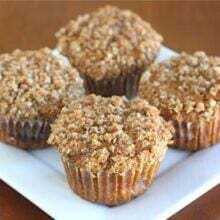 the streusel would gain that beautiful crunch. Now, that was good. I made these this morning and they are SO good! I felt like I was having dessert for breakfast! They are VERY filling. They also must be accompanied by a glass of milk. I made these this morning! So delicious! I’m surprised how simple the recipe was to follow, I just figured something that tastes this good would take so much more effort. I will probably be making these once more before the Fall season is over. I just happened upon your blog when looking for a pumpkin pancake recipe to try, I’m SO GLAD I did I just made these for dinner -yes I’m crazy- and they were FANTASTIC!!! Thank you so much for posting!!! I made these last night for my husband. They were VERY delicious. I made two small changes just for our dietary desires. I used Splenda brown sugar and WHOLE Wheat flour. Thanks so much for sharing this!!! I just made these this morning, with a few mods, and they were fantastic. Everyone loved them, especially my son who is home from the military. I was out of milk so I used eggnog I had in my fridge (he loves eggnog) and used quinoa flour in the streusel topping. And I topped them with Cinnamon Brown Butter from this recipe: http://www.tasteofhome.com/Recipes/Pumpkin-Pancakes-with-Cinnamon-Brown-Butter. Yummy! I have a question: I see there are 2 types of flour used – whole wheat and all purprose. Can you do without one, if you only had one? Ok, I stand corrected, there are several reviews from people who have tried it, I guess I skimmed over the comments too quickly…my apology. I did use all white flour and for the streusel I put pats of butter on top of the pancake on the uncooked side and then sprinkled the dry ingredients over it then flipped it. It came out perfectly crunchy. I did use about the half the amount b/c I didn’t want them to be too sweet. The Cream Cheese Syrup is really amazing with it: Cream cheese, cream cheese frosting, milk, and condensed sweetened milk. Try it with them and you’ll flip out even more. I followed your recipe exactly and I’m sorry, but this doesn’t make NEARLY enough!! These are fantastic, truly. I want to eat them alllllll the time. Definitely a once a year treat, though. Some feedback, however. Firstly, for those of you using your electric griddle, ignore your “suggested” pancake setting – stick closer to 350°F, otherwise the streusel will burn. (Yuck!) Secondly, I adore streusel – it’s the only reason to eat apple pie – but I would half the recipe here and, like another reviewer suggested, only put 1-2 T on the top and that’s it. It’s difficult to get the bottom streusel-covered and achieve that signature crunch without overcooking. Thank you for a recipe I will use for a very long time! Wow absolutely amazing. I wanted to make acorn squash pancakes and found this recipe and substituted the squash. I also made homemade caramel syrup. Your recipe is phenomenal and our new favorite. We are looking forward to making them on Christmas morning for our family this year. Love, light, and gratitude to you both. Hi Maria! I absolutely LOVE your blog! I made these for my family on Christmas morning, and my mom requeseted them five days later for her birthday! Definitely a favorite in my family! Thanks for another great recipe! I’ve made these without the topping. The pancake alone is great with a little maple syrup. These were AMAZING! I added some grated apple (b/c it needed to be used) and some OJ soaked raisins to the batter. What we didn’t finish today went into the freezer as a future breakfast treat for my toddler (who is just weeks younger than your son). Yum Yum Yum. These are definitely a new family favorite. I just made these this morning with my left over pumpkin after our Canadian Thanksgiving dinner. So delish! Very rich and extremely moist! The topping is a really great addition. Thank you! Thanks for the recipe! I love trying new pancake recipes. These cookies taste amazing! Thanks for sharing! I have the dough sitting in the fridge, I am wondering if that cornstarch trick works for sugar cookies….any thought? Ok. So i tied these today. They taste good, but probably are the most frustrating recipe for pancakes I’ve ever tried. I had to make a double batch for my huge family. They are just are very difficult to work with. oh well. maybe it was something I did to them, but I followed the recipe to a T just doubled it. I found also that the recipes is too think toactually cook the pancakes all the way through. They were gummy in the middle. I actually ended up having to bake them to finish them through. Maybe you can give me some pointers? These look like the best breakfast ever (if made by someone else :D)!! I very rarely make pancakes, but am lucky enough to have a wonderful boyfriend who enjoys making them. I’ll have to share this with him and hint that we need some breakfast soon!! How can I convert this recipe from pancakes to waffles? These were amazing! Everyone I knew loved them. Thanks for the simple and delicious recipe! We have not made these 3 times and they are a family favorite! My 2 1/2 year old son asks for them almost everyday! Now pumpkin is a staple on the grocery list so I can fulfill his breakfast dreams! Pingback: 52 AMAZING Pancake Recipes; One For Every Week Of The Year! I made these this morning and the taste w excellent. I don’t know how you were able to get your topping to look cooked/browned. When I put the topping on after flipping the pancakes it didn’t look cooked and I didn’t want to eat raw flour so I flipped them again to cook the topping. Did you cook your topping in a pan first then put it on top or put in under the broiler to toast the topping. Has anyone else had this problem? The topping should cook into the pancakes. Don’t turn the heat up too high so they can cook slowly! Can you alter to make these with JUST All-Purpose Flour?